Plot Overview: On holiday from a British boarding school, Candy Brown (Mandy Miller) visits her mother and stepfather at their villa in a Italian coastal town. To her shock, Candy learns that her mother has committed suicide by sealing herself in a room and turning on the gas. Candy immediately suspects foul play, but the police inspector insists that's impossible: the servants found Candy's mother in a locked room completely sealed from the inside. The young woman remains unconvinced. She believes the murderer is her stepfather Paul (Peter Van Eyck). As a girl, Candy claimed that she saw Paul drown her father. No one believed Candy then and no one believes her now, not even her companion, Jean (Betta St. John). It appears that Paul has a perfect alibi. And besides, as the inspector pointed out, how could murder be committed inside a locked room? Rick: Hi, Sark. 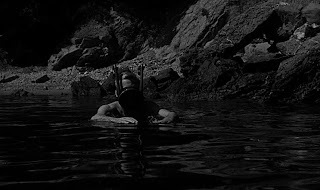 The first time The Snorkel was on TCM, I saw only the beginning and I know you saw only the end. So, I was thrilled when it was released as part of the Hammer Films Icons of Suspense Collection. Now that we've each watched it, we can discuss the whole movie. I decided that this film features my favorite pre-title sequence of all time. I remember watching it the first time and thinking: "What in the world is this guy doing?" When I figured it out, I was initially shocked and then intrigued. It's deviously clever! Sark: As you said, I initially saw only the final third of the film. It was intriguing, and I was surprised to see that it was a Hammer production because I'd previously not heard of it. Going back and watching the movie from the beginning, I was a little disappointed, since I knew what was happening. But for someone who's watching The Snorkel for the first time, the opening would have been a bit of a shock. For the first few minutes, you're just trying to decipher what's being shown to you. It's a splendid way to pique interest. A number of Hammer films open in a similar manner. Even some of the Frankenstein movies open with the doctor working, and you may know the doctor but really don't know what he's doing, where he is, if he is close to completing an experiment, etc. Rick: That's a good point, Sark. I recently watched the 1963 Hammer picture Cash on Demand, which opens with an unusual "introduction" to a bank. It's not nearly as gripping as The Snorkel, though. Still, The Snorkel has more going for it than a spiffy opening. I was intrigued by its structure...which is almost Hitchcockian. I mean we know who was murdered, how, and by whom. There are no surprises. The suspense is generated by the cat-and-mouse game between two of the characters. Sark: Hitchcockian, indeed. I like that the snorkel of the title is essentially explained at the beginning, but it can truly be incorporated into the whole of the film. And like a Hitch film such as Vertigo (released the same year), you can look at the title superficially (Jimmy Stewart is afflicted with vertigo), but it can also be viewed on a thematic level (Jimmy's relationship, his entire life is in vertigo, it seems). Without giving anything away, since a snorkel helps a person breathe, that's what it must be like for Candy. The girl feels alone because no one believes her, and if such is the case, then will anyone be able to protect her? Such pressure can make a person short of breath. Rick: I think you're on to something. A snorkel also conceals its user, who swims just below the surface of the water but is not necessarily visible. That's an apt description of Paul, who cruises under the surface of the events around him -- skillfully avoiding giving too much away about himself. From the viewer perspective, that makes him a prime suspect and we soon start to think that Candy is right about his homicidal tendencies. Hmm...that analogy may be a stretch...but I still like it. Sark: No, that's a very good analogy. And we can take that metaphorical snorkel and say this: With Paul apparently having the upper hand, it's as if he has the snorkel and is watching Candy drown. But the girl isn't completely helpless. She may be on her own, but she can save herself. There are many ways to prevent her "drowning," many ways to make people pay attention and see that something is amiss. And Paul's plan, like any plan, isn't foolproof. Eventually, he'll have to remove the snorkel and expose himself. Then it's simply a matter of who between the man and girl is the most believable. Rick: Nice! Hey, what did you think of the performances? I thought Mandy Miller was very believable as Candy. My spouse looked her up and learned that she played several film characters named Mandy (and, of course, Candy). 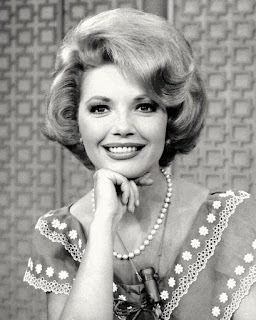 Her most acclaimed performance was as a deaf-mute girl in Mandy (aka Crash of Silence), one of those movies I've always wanted to see...but haven't. Sark: I thought the performances were good overall, with Mandy Miller a standout. Peter van Eyck had a great look -- he was sometimes outright creepy -- but his portrayal of Paul was a little too stiff. That didn't necessarily affect the character, but the actor came across as a bit theatrical. Aside from the peculiar plot and Miller's performance, did you notice any other distinguishing characteristics of this movie? Rick: Well, I'm always a sucker for an atmospheric seaside setting. The beach scene, by the way, was one of my favorites. After Mandy accuses Paul of trying to drown her, she pauses and then asks if she can still have the snorkel in his room. I thought that a very natural, impulsive mistake for a young person to make. Mandy would have been better off, of course, either keeping quiet about the alleged drowning or just hurrying back to the hotel to steal the snorkel. What about you? Any final thoughts on The Snorkel? Sark: The Snorkel isn't the best movie produced by Hammer Films, but it's undoubtedly a gem. A good number of the Hammer thrillers were rich in atmosphere, as you pointed out in this film. 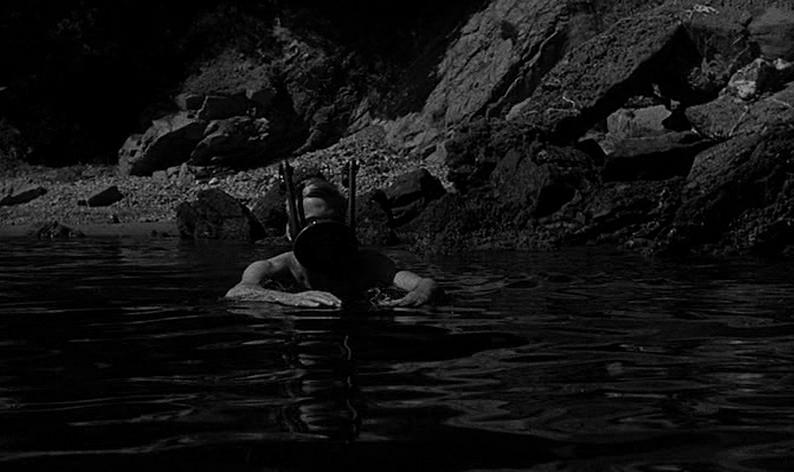 They were not unlike Val Lewton movies, e.g. Cat People (1942). But the Hammer thrillers, such as Paranoiac (1963) and The Nanny (1965), also thrived on strong characters and wickedly insane plot twists. The Snorkel is the same, and it makes for repeated viewings. What says you? Rick: I couldn't agree more. I'd rate The Snorkel a notch below The Nanny, but I strongly recommend it. This was a great discussion; I really enjoyed your insights. Any more coffee left in the pot? I think the Cafe oughta provide some free samples...I could get into a hot, fresh croissant right now. Sark: I'll skip that croissant in favor of another cup of coffee. Thanks, Rick. Next time, we'll do a Top 5 List of our favorite Hammer thrillers! This is fun! I'm dying here - if it doesn't give anything away to say who died, who did it, and how, pleeeaaaaase tell! I'm down on my knees (well, just my good knee) to beg for that info. I love Hammer horror films, but have not seen their suspense films, apparently, because I don't recognize the titles you mentioned. How about it, boys? Show mercy! Thanks for this guys. "The Snorkel" is one of Hammer's little sleepers. Van Eyck is wonderfully cold - a real sociopath. The original screenplay had Candy NOT going to the police (not giving anything away there!) - which would have made for a much darker ending. WH, that would have made for a much different movie! And Becky, you're not getting anything out of me...not a peep. 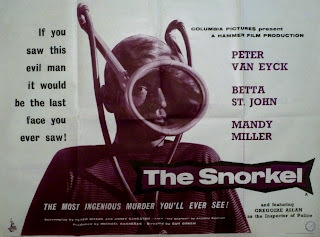 Fortunately, TCM showed THE SNORKEL once and probably will again (one of these days, TCM should have a Hammer month). Also, for Hammer fans, I strongly recommend the Hammer Icons of Suspense DVD set. 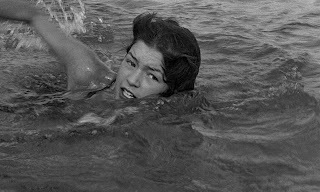 It has six movies, including THE SNORKEL and Joseph Losey's terrific THESE ARE THE DAMNED. Plus, it's on sale (6-11-10) at Deep Discount for $15.48 with free shipping. I agree, WH, that such an ending would have been dark! I like the ending as is, but I think the original scripted ending would have worked as well. Becky, here are the answers to your questions in code: RR191. Unfortunately, my code is unbreakable (even I don't know it), so it's probably not much help. I haven't seen this film, nor many Hammer films, but I enjoyed reading your delightful conversation about this film. Very funny, Sark, V-E-E-R-R-Y-Y funny. Sounds like part of your license plate number. And Rick, Rick, I don't know what to say -- well, actually, I just thought of a great retort in limerick, but I would be breaking the CMBA code of behavior! Saw this weird flick on TCM a while back and thought it was cool. Has anyone seen the other movies in the DVD set? Are they any good? Anon, I've seen three of the six movies in the Hammer Icons of Suspense set. THERE ARE THE DAMNED is definitely worthy of its cult film rep. CASH ON DEMAND is a nifty little pic with excellent performances from Peter Cushing and Andre Morell (I only wish the ending was better). Obviously, I liked THE SNORKEL. I haven't seen the other three yet. I've seen two others from the aforementioned DVD set. STOP ME BEFORE I KILL! is interesting if not altogether satisfying, but it does have a wonderful opening. MANIAC has some creepy moments, and though it may be predictable, I thought it was quite a fun ride! Gentlemen, I loved your wonderful chat about "The Snorkel." I really liked this film a lot. I enjoy mysteries very much, even when I know whodunnit. I thought that Mandy and Paul were both excellent. A weaker link in the film is Jean, because she seems to dismiss Mandy too readily, even knowing the young girl has just lost her mother and has become an orphan. But many a film has relied on the stupidity of characters to further their plotlines and this film is no exception. "Cash on Demand" is quite good, too, but I agree with Rick that the ending was not strong. The performances were, however, remarkable and I recommend it whole heartedly. Great job, Sark and Rick! I'll have a mocha frappe, by the way. 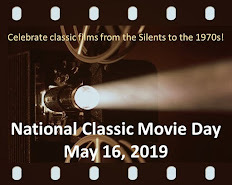 You must watch one of the best films in the Icons set - "Never Take Sweets/Candy From a Stranger". A very powerful and dark film that, because of its subject matter (child abuse), only recived a very limited art-house release in the US, and was castigated in Britain - because it came from Hammer therefore it must be 'exploitative'. Nothing could be farther from the truth. If you want to see a real Hammer 'monster' then Felix Aylmer's completely non-speaking character is the stuff of nightmares. A very powerful film and way ahead of its time (1960). I saw this movie after reading about it in The British Film Noir Guide, so I knew how it began. Am I the only viewer, though, who was let down by the absurd stupidity of the Gregoire Aslan character, in the role of doofus detective, who could have seen it was murder and not suicide just by paying attention to the unignorable dog in the first ten minutes of the film? This complete lack of credibility, and the later actions of the Van Eyck character in his attempts to cover up, rather spoiled it for me. Many Hammer noirs are superior to this. Bond Is Forever: "The Spy Who Loved Me"
Losing Control to "The Lady from Shanghai"
A Cruel World, A Crueler Man in "Kiss Me Deadly"
Mystery Man...do you know him...?